On the example of producing nodular iron with different properties there are shown possibilities of using new experimental and computer-aided methods for investigating them. Key words: cast iron with spherical graphite, nucleation, transformations, strength, ductile-tobrittle transition. When investigating into the interaction of the alloying coating there have been established process stages. It is shown that the wetting effect influences the impregnation process. Determined are alloying coating compositions and basic casting manufacturing parameters. It is expedient to use low-melting-point materials for surface alloying. Key words: alloying element, cast iron, diffusion, alloying coatings, metal, alloying of castings, cast iron macrostructure. We consider a method of forming the surface of the doped layer increased hardness containing titanium diboride on castings made of gray cast iron by gasified models. The formation of titanium diboride in the synthesis proceeds in the coating alloying initiated thermal energy poured melt was shown. Key words: Surface alloying, casting on gasified models, doped layer, alloying composition, synthesis. It is showed the influence of depth freatment of the melt by cold and high temperature gas-fluxing agents on efficiency of reining of the alloys, structure and the properties of the aluminum castings. Key words: Plasma jet, gas-flux treatment, hydrogen, oxides and refining the alloy structure, the properties of castings. Given developed design granules styrofoam hardening shell technological scheme of obtaining from them hollow spherical shells for the manufacture of a porous -coated and cast microstructure photographs wall hollow shell after pyrolysis and sintering styrofoam. Considered the most tech devices and vacuum impregnation with a metal mesh flap free impregnation of porous samples in the manufacture of castings from alloys based on Al, Zn, Pb. 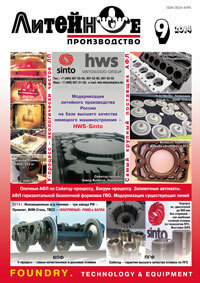 Features photographs of destroyed compression deformed samples silumin porous castings. Key words: Гранула ППС с упрочняющей оболочкой, полая сферическая оболочка, пиролиз, прокаливание, микростроение оболочки, вытряхной кокиль, вакуумный поддон. The maintenance of the new automated Information Platform system on providing factory founders and students of universities visual and logical system of improvement of quality of castings is considered. The system is provided with conditions of fast response to inquiries of researchers or students on recognition of kinds of foundry defects, stages of their formation and ways of elimination. The platform consists of 3 levels. Key words: Defects of castings, steel, cast iron, form, core, litnikovy system, kinds of defects, stages of formation of defects, the visual and logical approach, the automated system, the analysis, decrease in marriage of castings. Choosing the moulding technology for manganese steel casting production is a challenging task for any foundry production. The article provides selection rationale for vacuum moulding technology with specific references to the world’s leading foundries. Key words: Mining and milling companies, manganese steel castings, Vacuum moulding process. The article contains survey data on the current state of electrophoretic (EP) shaping of foundry molds, results of conducted investigations into the influence of various technological factors on the properties of EP shell molds (SM). There are presented results of mathematical modelling of strength formation in SM made by the electrophoresis method, and analysis of the data obtained. Issues of restoring EP properties of suspensions are broached, and analysis of processes taking place during heating of EP molds is presented. Key words: Electrophoretic molds, shell molds, mathematical modelling, strength. The article presents the experience of leading European plants producing cast iron boiler sections as well as heating radiator and proves the technology choice for these critical castings. Key words: Boiler sections, radiators, hydraulic sound castings, Seiatsu-process.